ID : Bear Lake Co.
September 10, 2012, L G Crabo leg. 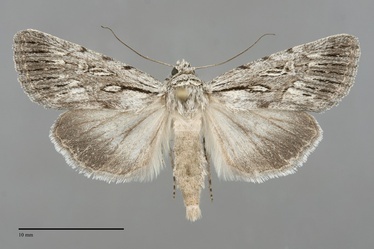 Sympistis chandleri is a medium-sized (FW length 15–16 mm) longitudinally streaked gray moth with a fused orbicular and reniform spots, a long ovoid claviform spot that is connected to the wing base by a long black dash, and a pale hindwing with a gray marginal band that flies in extreme southeastern Idaho during the fall. The forewing is powdery medium gray, lightest gray often with a slight blue tint basad to the antemedial line and in the postmedial area, and darkest in the posterior medial area and on the distal wing. A series of thin black lines, sometimes interrupted with pale gray at the expected position of the subterminal line, extend from the postmedial line to the margin between the thin dark veins. The basal line is absent. The antemedial and medial lines are evident as diffuse dark gray spots on the costa. The postmedial line is variable, dark gray to black, forming a similar black spot on the costa and then evident as a slightly scalloped oblique line between the anterior reniform spot to the claviform spot that is darkest between the lower reniform and claviform spots. The subterminal line is absent, its position evident as the interruption of the dark lines on the outer wing. The fringe is gray, similar to the ground color, weakly checkered with darker gray. A black basal dash extends to the base of the claviform spot, often continuing as a thin tapering line in the spot. The spots are outlined in thin black outer and wider light gray inner components and are filled with gray lighter than the ground color and often a black central line. The orbicular spot is very long and is fused to the triangular or kidney-shaped reniform spot. The claviform spot is oval, long, reaching the postmedial line in most specimens. The hindwing is slightly brownish off-white with gray veins, a weak thin discal spot, and a medium gray marginal band with an indistinct inner edge. The hindwing fringe is tricolored, tan, dark gray, and off white. The head and thorax are grizzled dark gray with dark and light gray bands on the collar, widest dark near the base and edge. The male antenna is filiform. This species is similar to several other gray longitudinally streaked Sympistis species in our region, particularly Sympistis poliochroa, Sympistis major, and Sympistis utahensis. 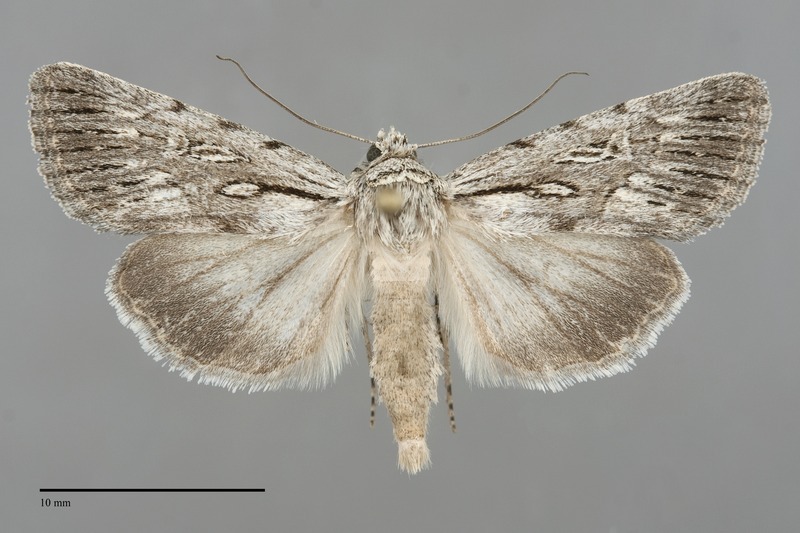 Sympistis poliochroa is darker gray with a more strongly streaked forewing. 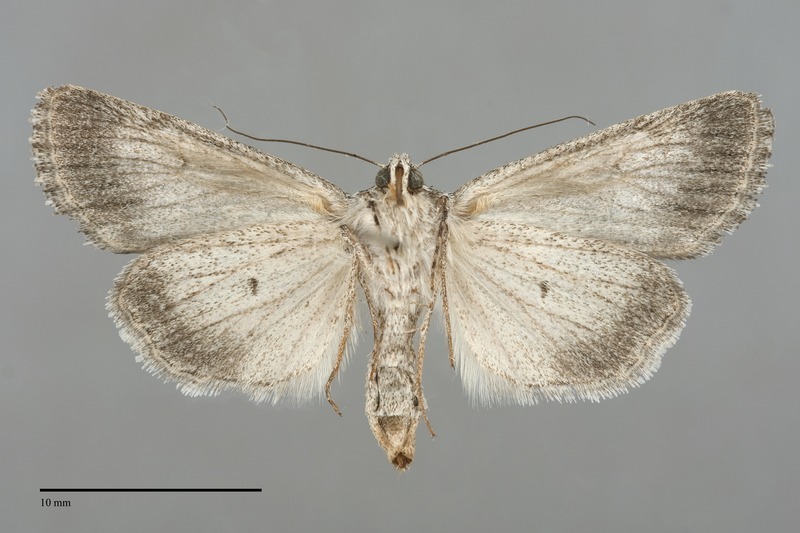 Its hindwing marginal band is nearly black with a sharply defined inner edge, not as dark and well demarcated in S. chandleri. Sympistis utahensis also occurs in southern Idaho, although it has not been collected together with S. chandleri. 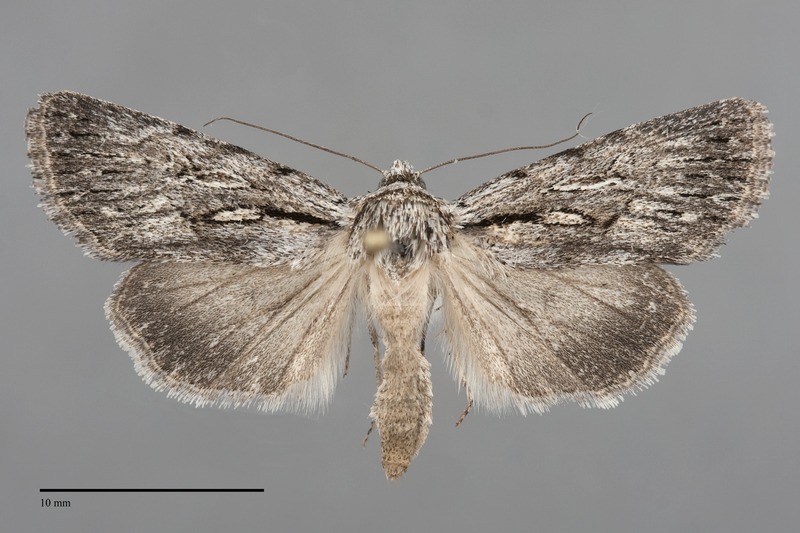 Its distal forewing is darker gray than in S. chandleri, and the black dashes on the distal wing are stronger than in S. chandleri and lack the interruption at the subterminal line. 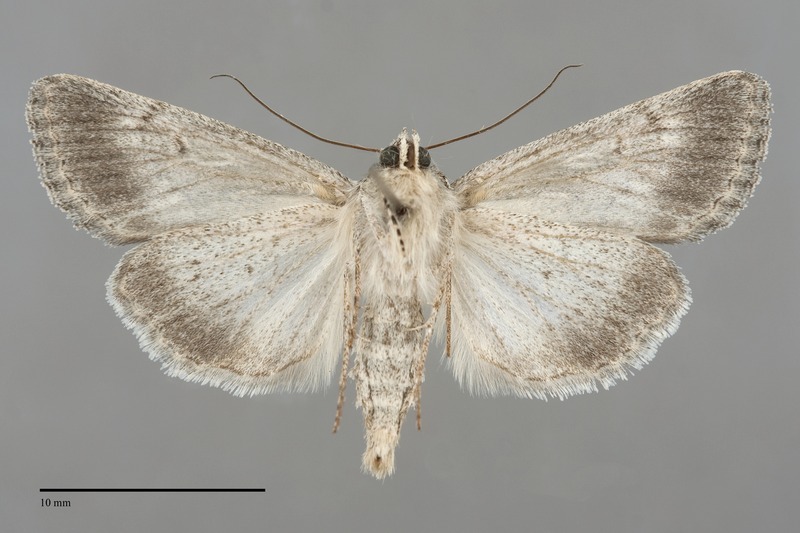 The hindwings of these species are similar. Sympistis major usually flies earlier in the summer than S. chandleri. Its forewing is streaked but differs from that of S. chandleri by lacking prominent black dashes. This species has been collected in parkland with mixed sage steppe, riparian shrub, and aspen groves in the Pacific Northwest. Sympistis chandleri has only been found in the extreme southeastern corner of Idaho in the Pacific Northwest. It might be more widespread in the eastern part of our region, but this area is poorly collected. The life history of S. chandleri is unknown. The most likely larval food plant is beardtongue (Penstemon sp.) based on the known life histories of related Sympistis species. Adults fly during the fall and have been collected during September in the Pacific Northwest. This moth is nocturnal and is attracted to lights.